Simply Heaven! Jaw dropping View and watch the Dolphin Show from the Balcony! You are first drawn to the Amazing Views from the wrap around balcony upon arrival. The view is breathtaking and immediately puts you in relaxation mode - island time it is. No expense has been spared in the renovation and decoration of this gorgeous split level villa. The kitchen and bath are newly renovated with all the comforts of home. Point Pleasant is located between Margaritaville & Sugar Bay Resort. Mirador Restaurant is located at Point Pleasant and has more amazing views for you to enjoy and a pool just below with views to the BVI - all open to all guests! Spectacular views of ocean, islands, beaches, sunrises and even the moon rise will leave you in awe. Easy access in & out from upper parking lot, even though it's on the 3rd floor it's 1 set of stairs - 8 steps down to condo. Your wrap around deck offers you more views of countless islands on two sides and a cover for shade; your huge private deck is the perfect setting for drinks, alfresco dining and star gazing. Simply Heaven is a pristine and loved residence with total attention to every detail. It is the perfect place for an anniversary, honeymoon or proposal or anyone who wants to spend quality time with another. Three Pools at Point Pleasant - one just steps from the condo hidden away from it all, one just below Mirador Restaurant and one at the Shoreline, where you can get poolside drink service! Free unlimited WiFi and Cable in the Condo - bring your Firestick or Roku and stream your favorite shows. LOCATION: Perfectly located on the hilltop to give us our amazing views! We specialize in honeymoons and anniversaries. We belong to an association of owners that cater to weddings, family reunions and anniversary trips allowing everyone to stay together and each family has their own place to relax at the end of the day from the busy activities. Pat worked as a Director of Hospice until she became disabled. Bob Worked in the field of traffic engineering until Retired. We always loved the Caribbean! Our 1st place was St Croix where we purchased a time share cottage that we still love to go to and meet our friends from all over the USA that still come down, like a home coming! Caribbean Beaches are so much more beautiful with calmer waves and less crowed then any beach in the States including Hawaii. The Best Location on Point Pleasant! With Billion Dollar Views & Breezes. We purchased this amazing place at Point Pleasant and just feel like the most restful home :-) We have been renovating this lovely place over time. Just installed brand new kitchen 3 years ago and this winter renovated the bathroom head to toe. Also just replaced bedroom furniture, repainted and reappointed the walls with a themed look. View that will take your breath away. You can spend hours decompressing on our balcony. Easy access from upper parking lot. Rent from a Private Owner and save on the resort fees. Enjoy the convenience of delivery from most restaurants. We are an oceanfront resort with a private beach and you can walk to 2 more beaches for some of the best snorkeling on the island. Point Pleasant is a beautiful Eco-Resort with hiking trails. Gorgeous. View of Pineapple Beach as well as many tiny islands on two sides of your covered wrap around deck. Walk to a small private beach on the property or take your vehicle and park at the lowest level on property and walk trail to small beach for two. This is in an oceanfront resort. Of Course! two sides of our deck. Resort is waterfront, Ours is the views and ocean breezes! And less crowded and more beautiful then Hawaii! LOL, Really you want more heat? Top Hill Parking and easy access to our unit! Even though we are on 3rd floor it's only 8 steps down into unit. 50' pass the new gym building. 100' froom upper parking lot. Next to bedside stand. is the wireless unit with code. Sunken Living room with 40" flat screen TV with cable. Whirlpool Compact Tall Tub Stainless Steel Dishwasher. Tabs under the sink. Whirlpool 19 cu, ft.. Stainless Steel Top Freezer Refrigerator. Kitchen Aid 15 inch 2 Element Electric Flat cook top. Whirlpool 1.9 Cu. ft. Microwave Combination with Time Saver Plus True Convection Oven & Cookware. Stainless Steel. Stainless Steel Whirlpool combo Convection Oven / Microwave. Yes, supply of filters and sugar for your convenience. Toaster supplied! bread & bagels are up to you. Spices and paper goods are ready for use. Fully stocked dishes, glasses and silverware. Newly Renovated granite counter top & all stainless steel appliances including dish washer! Seat 4/5 inside and 4/5 outside dinning. Amazing Views and outdoor dining for 4! Check out Night Kayak! Or Virgin Islands Ecotours for great Kayak experiences! Have snorkel Gear & Blow up floating rafts. Also have electric pump to blow them up. We do have handicap bars in shower and toilet area and going down hallway stairs. With the exception of the antique four poster bed nearly all the furniture is comfortable and new. Beautiful Caribbean themed decorations. New Kitchen with Dishwasher! My wife and I needed to just get away and rest. We loved the view and the opportunity to simply relax. The villa was nicely equipped and appointed. Beautiful place! Wish we were there now :). The views are breathtaking and all the information we received from Xaverie was so helpful and very well organized. Thank you!!! Wow, loved ever bit of the unit, spending most of our time while there on the wrap around deck. The view was spectacular of Thatch Cay, St. John, Jost Van Dyke and Water Bay. Unit was really well appointed. Bathroom and kitchen very modern and well equipped. Really great location as well. 3 pools and 2 restaurants! Lobby was a special surprise to visit and look out over the Bay. The walking trails to the resort amenities will challenge those not in decent physical shape. There is a resort shuttle however. Thanks to our hosts Bob, Pat and Xaverie! Everything met or exceeded our expectations. Great stay in Virgin Islands. Beautiful views and a great property. Had a wonderful time and enjoyed breakfasts and dinners at both onsite restaurants. While the views and sightseeing are great make sure you get out on at least on boat tour to really experience the Islands. Thanks. Had a great time. Well-equipped condo with great views! This was our 2nd time staying in this condo, and the owners have totally upgraded the kitchen and shower. We love the proximity to Red Hook and Coki Beach, which has tons of fish when you snorkel. All 3 pools are open, as is Shoreline Bar & Grill. We sent several weeks at “Simply Heaven” it has a large wrap around balcony with amazing views and great breezes. It has everything you would need for your vacation including beach chairs and cooler. 2 of the 3 pools at the resort are open and Lindquist and Sapphire Beaches are very close.It has a nice restaurant onsite and is close to Margaritaville and Red Hook for a variety of restaurants. There are repairs and reconstruction going on at some parts off the resort as there is over most of the island but should be completed soon. Bob, Pat and Xaverie were very quick to respond and helpful with any questions we had. Thank You for the compliments and Thank You for staying with us! The views are amazing aren't they! Your kind words means that we are doing it right and hope to have you back in the near future. As always, while we're not on-island, Xaverie is and we know that we can count on her to ensure you have a great stay. Come back anytime! We would love to have you - thank you for taking care of our place and being great guests! 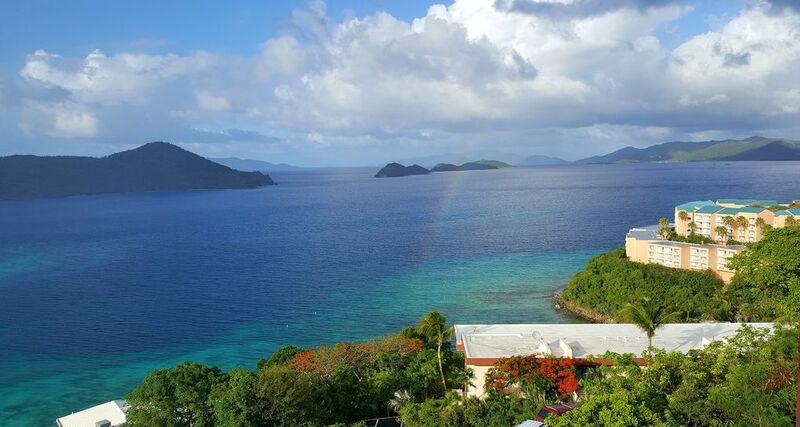 This condo has one of the most amazing views at Point Pleasant with a gorgeous 'down island' view of the British Virgin Islands including Tortola. It also overlooks Water Bay and Coki Point. This group of condominiums are as close as you can be to pretty Coki Beach and interesting Coral World. The East End of St. Thomas has most of the islands beaches, one after the other. It is also just outside Red Hook where the hourly ferry to St. John is located. Hence it is a perfect walk-to-beach location whilst being a perfect jumping off spot to tour the National Park of St. John. Closest condos to Coki Beach for the island's best snorkeling and scuba. Visit our National Parks in St. John. Great night life in Red Hook.